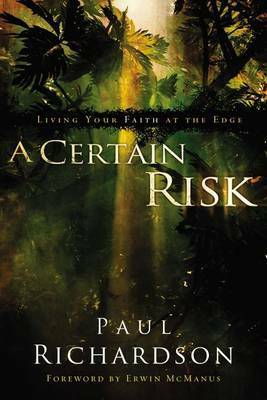 In his memoir, A Certain Risk, author Paul Richardson reminds you that the Creator designed you to engage the complexities of your world with creative solutions. Rather than offering a series of how-to steps, Richardson offers you a refreshing vision of what a Spirit-fueled life looks like-a vision that sees Christianity as a fluid, innovative call to love. Many of us lead frenzied lives-but feel we are going nowhere. Every day you may be asking yourself: "How can I become a voice of hope when the problems are so great? How can I envision my circumstances through God's eyes and respond to others with the passions of his heart when the dry details of the day take over? How do I begin to live a deeper, richer faith that unleashes God's transforming work in and through me? "Drawing on stories from his life as a change specialist in the world's largest Muslim country, Richardson explores what causes you to be pinned down under life's fluctuating circumstances, personal apathy, and disappointment, and he helps you seek the Spirit-fueled life that can set you free.You will come away with a deeper awareness of your dreams, a renewed passion for faith in action, and a richer understanding of how God created you to live ... straight from the heart of the Creator. Paul Richardson was born and raised in a village carved out of the jungle in Dutch New Guinea, where his parents were missionaries. With a bachelor's degree in history and a master's degree in educational leadership, Richardson is part of a group creating a network of state-of-the-art Christian schools in some of the most impoverished environments on earth. Richardson lives in southeast Asia with his wife, Cyndi, and their three children.